Every year as the warm weather leaves and cold weather moves in, cold and flu season comes and we are reminded of the importance of receiving an annual flu vaccination. Statistics show that 1 in 5 people will catch the influenza virus in any given cold and flu season (CDC). The flu is an extremely contagious respiratory disease that attacks the body by spreading through the upper and lower respiratory tract. 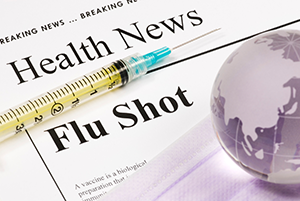 The flu vaccination decreases your chances of catching the flu from October to May. The vaccination takes about 2 weeks within the body to completely provide protection against the strain of flu for the upcoming 2018 - 2019 season. Some side effects from the flu shot to be aware of are redness and swelling where the shot was given, a low grade fever, and body aches. Cover your mouth and nose with a tissue when you cough or sneeze. If you don't have a tissue, cough or sneeze into your elbow or upper sleeve, not your hands. Get plenty of rest, eat properly, and dress appropriately for the weather. If you are feeling ill, prevent the spread of germs by staying home from school or the workplace, if possible. Return to work only after being fever free for 24 hours, without the use of fever reducers.